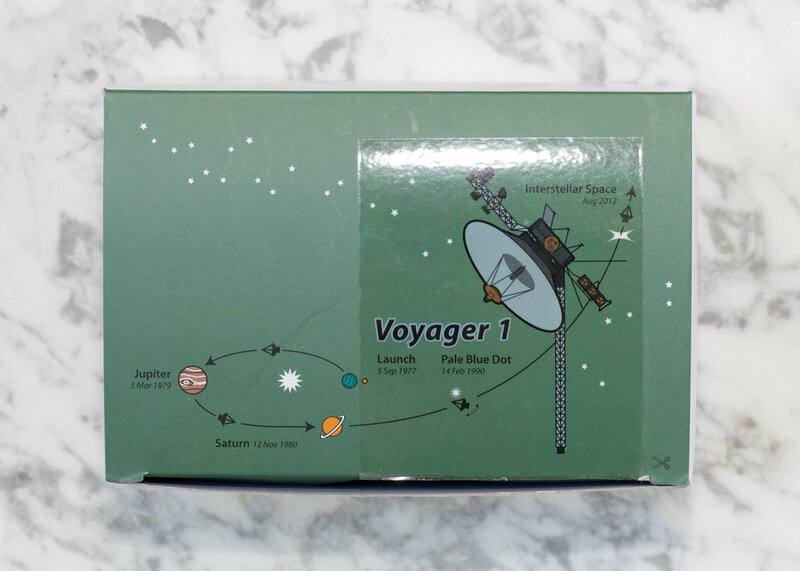 I purchased the Colorverse Voyager 1 box set a while ago, and I haven't played with it much. I decided today was the day to finally test it out. I purchased my set from Pen Chalet. 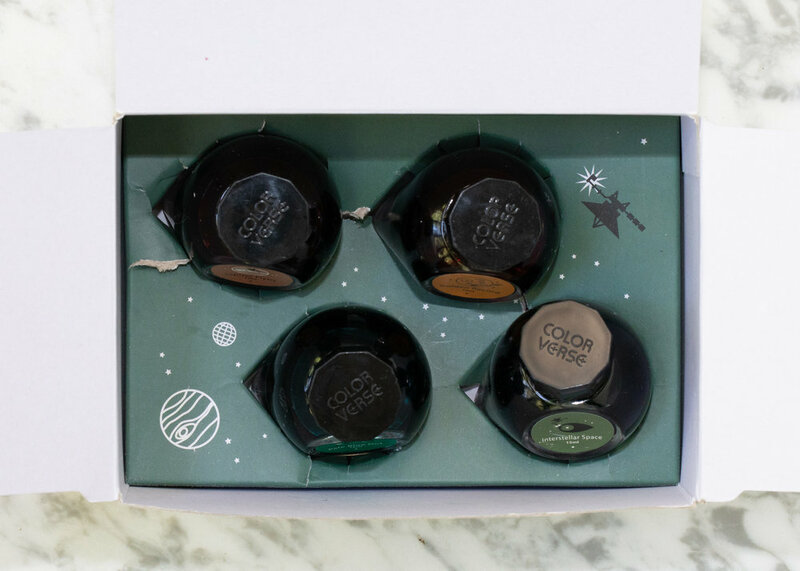 The box set includes four 15ml bottles. The box retails for $50, which is pretty darn expensive for 60ml of ink. There was no padding in the box, just a shallow paper liner with four indents for the bottles. I'm happy to say Colorverse has added padding to the boxes since this set was released. I love that they include information cards in the box, detailing the name, size, color, and ph of each ink. Left to right: Jupiter Flyby, a medium brown, Golden Record, a ruddy orange, Interstellar Space, a medium green, and Pale Blue Dot, a medium teal. I used an Inky Fingers Currently Inked notebook to write down which ink was in which pen. The ink drops show some lovely sheen. Interstellar Space dried the fastest at 30 seconds, Pale Blue Dot dried the slowest at 50 seconds. Other properties: low shading, low sheen, and no shimmer. Interstellar Space is the only ink with no sheen. On Staples 24 lb copy paper there was feathering and bleeding in each ink. Ink swabs for comparison, left to right (top to bottom for mobile RSS): Diamine Espresso, Colorverse Jupiter Flyby, and Birmingham Coffee Bean. 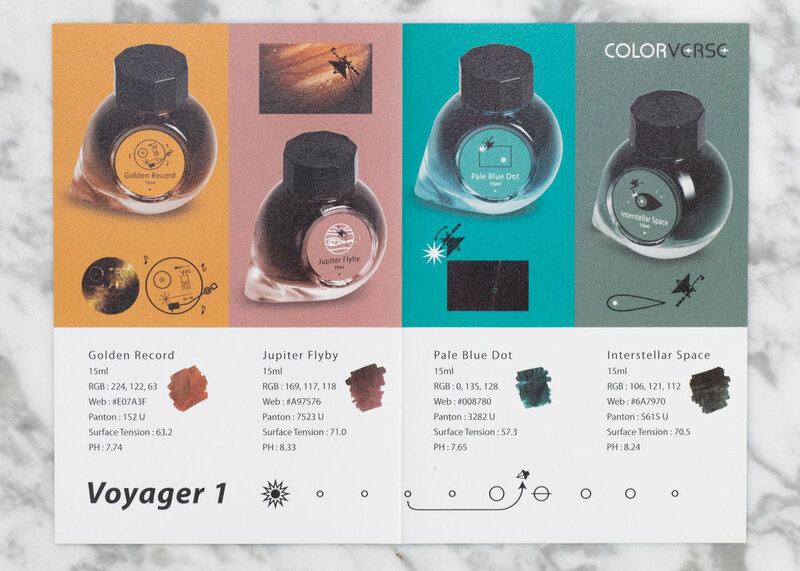 Click here to see the Colorverse inks together. I think Espresso is the closest. Montblanc Red Fox, Colorverse Golden Record, and Diamine Autumn Oak. 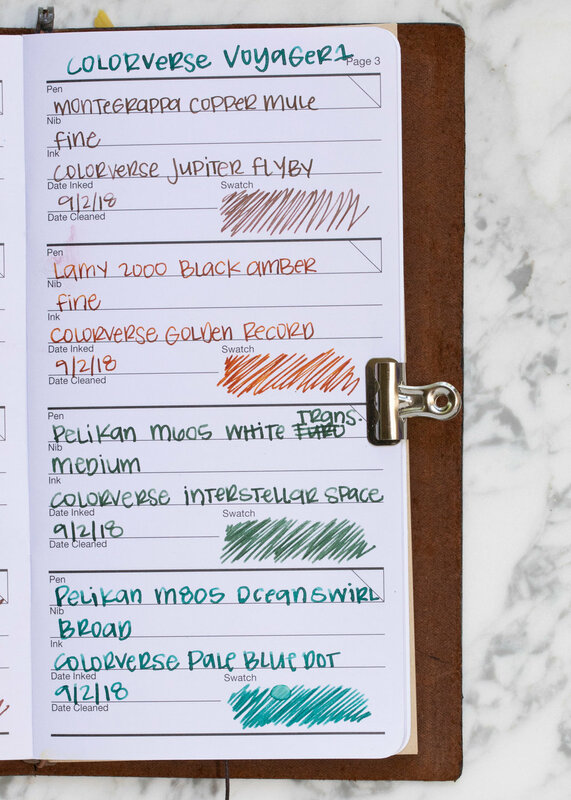 Pelikan Edelsten Olivine, Colorverse Interstellar Space, and Monteverde Jade Noir. Olivine seems the closest to Interstellar Space. Robert Oster Marine, Colorverse Pale Blue Dot, and Robert Oster Deep Sea. Pale Blue Dot has more green than either of the others. I used a fine Montegrappa Copper Mule, a fine Lamy 2000 Black Amber, a medium Pelikan M605 White Transparent, and a broad Pelikan M805 Ocean Swirl. The inks all had an average flow with no flow issues. Overall, I think the set goes well together, the inks flow nicely and are pretty well behaved. My only issue with this set is the price, I think $50 for 60ml is a bit pricey for what you get.